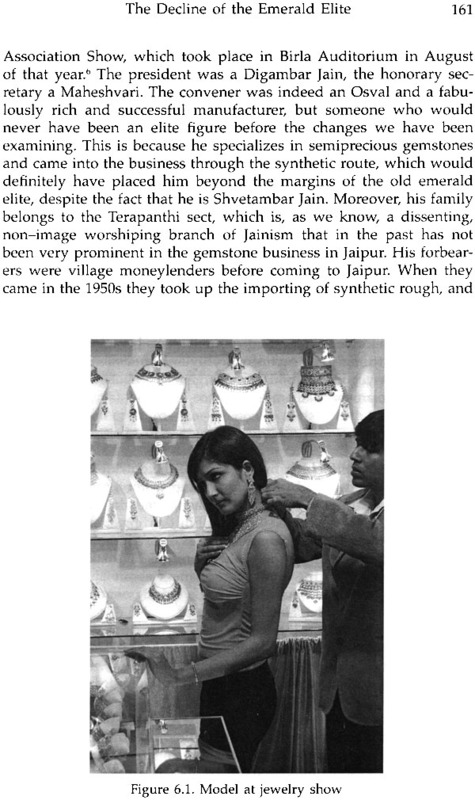 Lawrence A. Babb's Emerald City provides an intriguing portrait of the gemstone cutting industry of the North Indian city of Jaipur. It focuses on the ownership class consisting mainly of Jains and members of northern India's traditional trading communities. Based on oral-historical investigations of family firms, along with ethnographic observations and interviews, the book describes how the industry is organized, when and how it developed its characteristic features, and its evolving relationship with its social context. 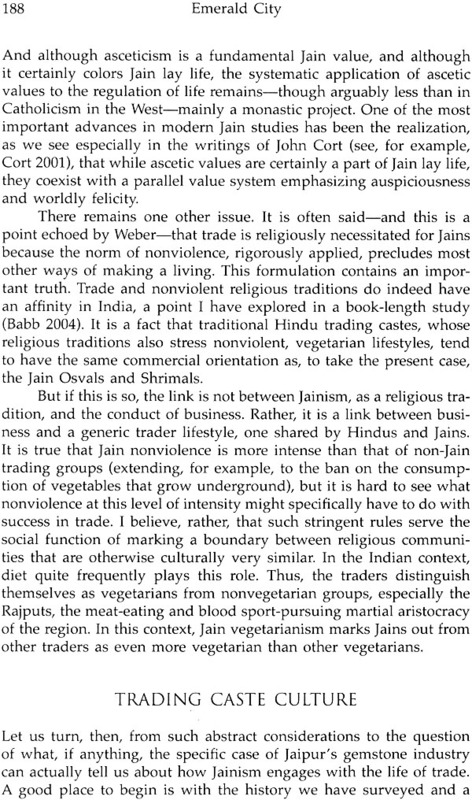 Babb pays special attention to the impact of culture on the business, with particular emphasis on the role of religion, specifically Jainism. 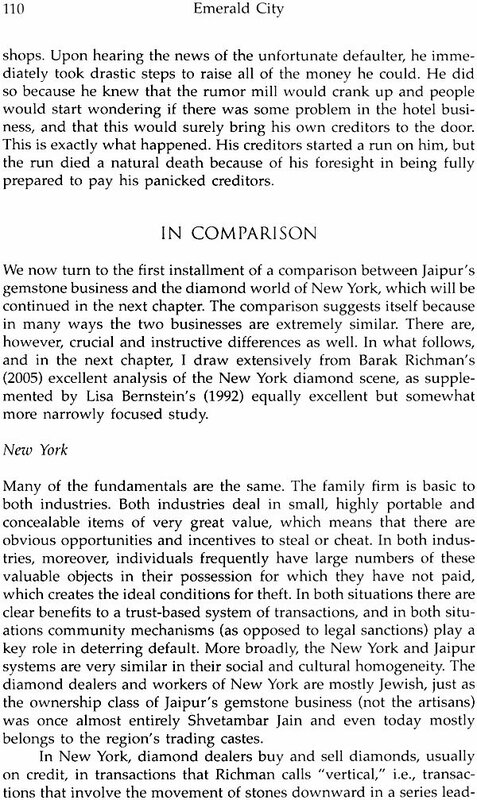 He also offers a systematic comparison between Jaipur's gemstone business and New York City's famed diamond industry. 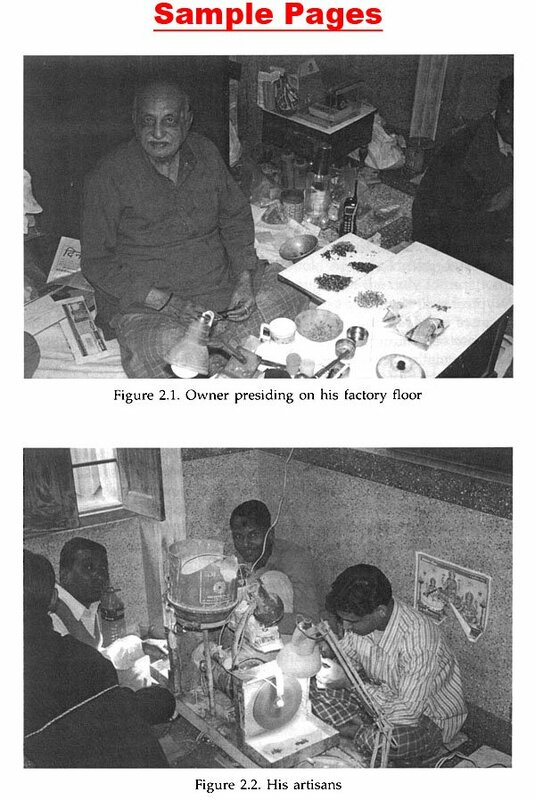 In its application of ethnographic methodology to the study of an indigenous Indian industry. Emerald City delivers a unique perspective on business life in a non-Western setting. Lawrence A. Bab, is Professor Emeritus of Anthropology and Asian Studies at Amherst College. 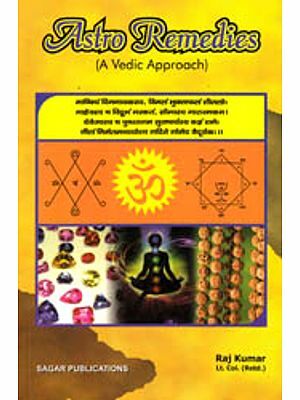 He is the author of several books, including Alchemies of Violence: Myths of ldentity and the Life of Trade in Western India and (with John E. Cort and Michael W. Meister) Desert Temples: Sacred Centers of Rajasthan in Historical, Art-Historical, and Social Context. I have to be honest. I was initially drawn to this subject by its simple romantic appeal, not by some abstract theoretical puzzle, and at first I had no notion of doing any writing about it at all. Research on other topics, mainly connected with Jainism and western India's trading communities, had led me to the city of Jaipur in 1990 and to a street and area of the city known as Johari Bazar. 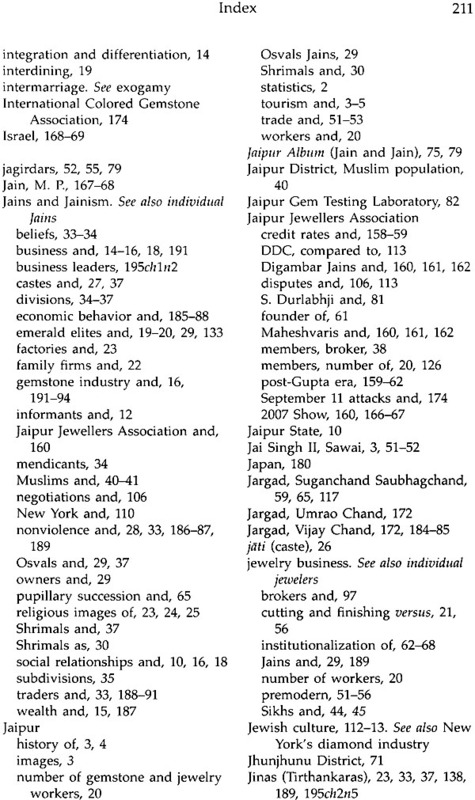 This is the city's main jewelry and gemstone zone, and there in the course of my Jainism research I met lots of people in the gemstone business. 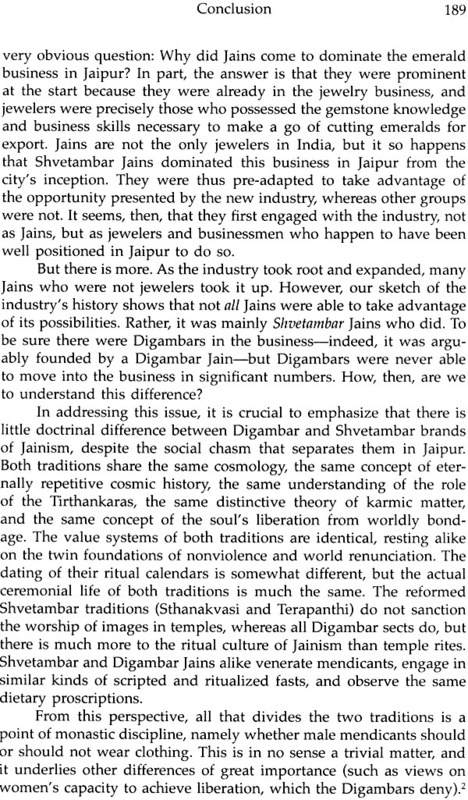 During that year, my first in Jaipur, and for years thereafter I had a continuous view out of the corner of my eye of the business and its goings on, for even though it was not the subject of my formal research, it was impossible to ignore. Here were little heaps of emeralds, rubies, diamonds-e-exquisite stones of every sort. They were being treated as if they were perfectly ordinary things, but they certainly didn't seem ordinary to me. And there was plenty of money around, too, sometimes bundles of large-denomination bills coming and going in shopping bags. This is definitely interesting, I thought. But what most attracted my attention, at least at first, was not the money but the sheer wondrousness of the stones themselves. When properly finished, they are objects of great beauty. And they are not just physical objects. They bear and compress value, often very great value, and not just monetary value. There is a vast lore about them-about their properties, physical and metaphysical, their origins, and even their individual careers. The stories of gems, especially the great ones, are intertwined with the histories of families, cities, and even nations. But as I say, I observed all this indirectly while I attended to more immediate problems. 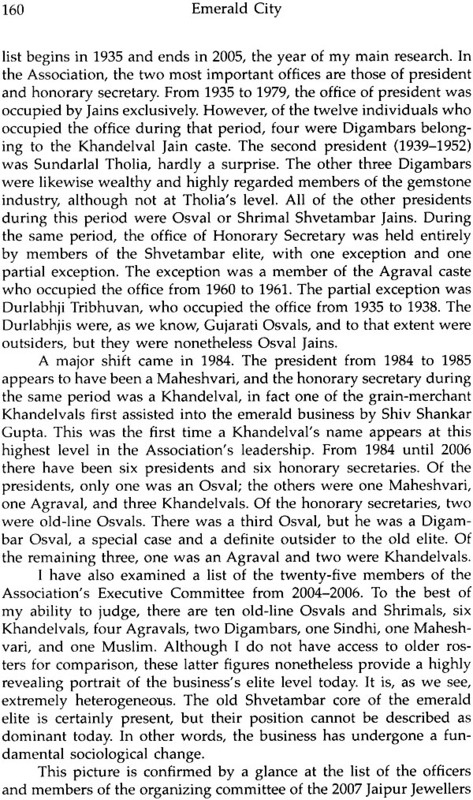 My chance to learn more about the gemstone business didn't come until 2005. Other projects were finished, and at long last I had the chance to start the research on which this book is based. I began with a four-month stay in Jaipur late that year, and I was able to continue my inquiries during additional visits in August of 2007 and the spring months of 2009. As one might expect, the romance of gemstones receded somewhat. This business isn't "just" business, as I hope this book will show. Maybe no business is. Still, it has its nuts and bolts, and these had to be learned before I could say anything sensible about the gemstone trade. And I have to admit that this side of the project was also fascinating, albeit in a different way. There is something a little bit magical about the transformation from rough stone-looking for all the world like dirty, colored gravel-into finished gemstones. And while I can't honestly say that there's much magic in the give and take of the commerce that is the industry's lifeblood, to understand it properly is a serious intellectual challenge and a worthy goal. Although I had imagined my gemstone work standing apart from my other projects, in the end it turned out that the work I had done previously on Jain communities and the trading castes of Rajasthan was indispensable background. 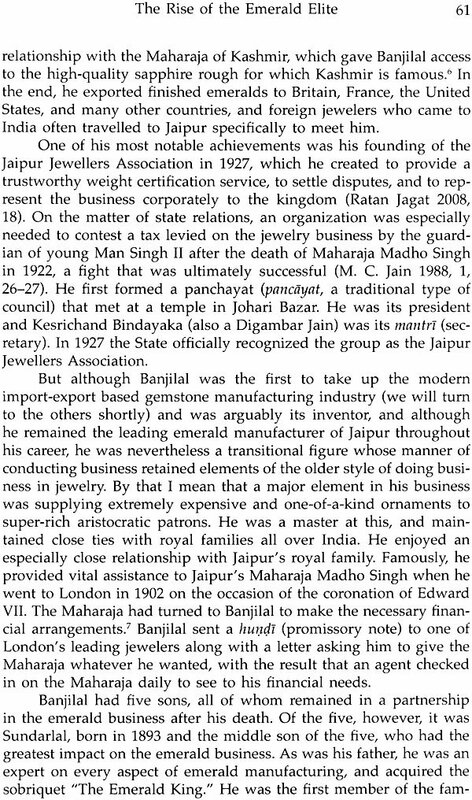 For one thing, my earlier work among Jains was a crucial source of initial contacts and an entree to social networks in the gemstone business, and I'm not sure I could have done the work at all without this initial boost. 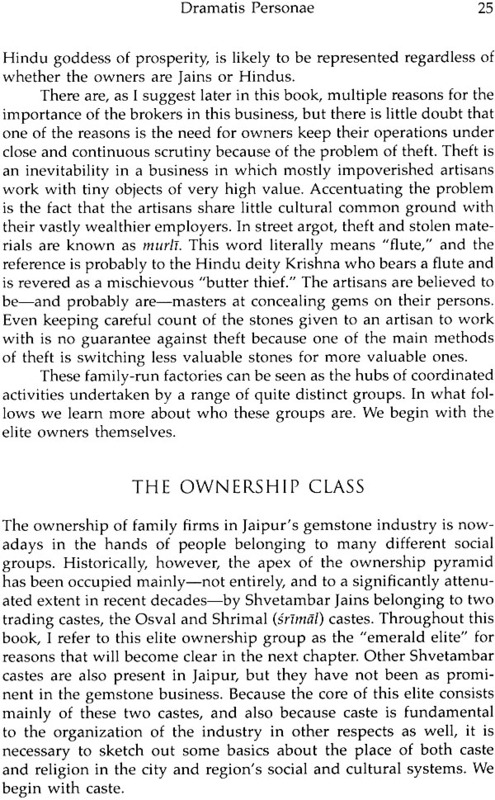 But more important yet, both caste and religion emerged as central to my gemstone research. 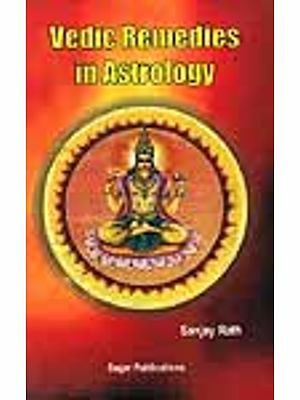 To study a business of this sort is necessarily to study its social and cultural contexts; indeed, this is one of the main points this book makes. And to achieve even a rudimentary understanding of Jaipur’s gemstone industry requires that one know something of where and how caste and religion fit in the city's and region's social structure. Jaipur is the capital city of the Indian state of Rajasthan and the state's largest urban center. According to the 2011 census, its population is roughly 3 million. This figure is almost certainly missing large numbers of migrant workers from such places as Bihar. Because much of the old walled city is colored by a pink wash, Jaipur bears the sobriquet "the pink city," but for reasons that this book will make plain, Jaipur will always be the emerald city to me. The city was founded in 1727 by Maharaja Sawai Jai Singh II (1688-1743) who shifted the capital of his kingdom there from nearby Amber in 1733. It was a planned city, with broad major streets laid out in a rectilinear pattern with the palace complex at its center, the whole within walls. This walled city-the "real" Jaipur is nowadays merely the core of a much larger city. In looking around the walled city today, especially in the early morning before the start of the day's business, one can see that it was once a comfortable city, spacious and airy. But while something of its original comforts are still within the range of living memory, it is desperately overcrowded today, as is much of the rest of the city. Problems of extreme traffic congestion, noise, air pollution, and a host of other urban ills have driven many of its former denizens out of their families' dwellings in the walled city to residential colonies in the city's newer outskirts. But despite its many current problems, Jaipur is a very beautiful city of great historical and cultural interest. Because of this, it is a major tourist attraction, and few foreigners visit northern India without at least stopping briefly in Jaipur. Nowadays it is also a destination for Indians on holiday, especially from nearby Delhi. On weekends, the city's restaurants and hotels are crowded with out-of-towners, and downtown parking areas are dense with cars bearing Delhi and Haryana license plates. Tourism in Jaipur and Rajasthan rests on the foundation of a highly romanticized image of the Rajputs (rajputs), who were the old martial aristocracy of the region in which Jaipur is situated. This region was known as Rajputana in the days of British rule. It consisted of a number of kingdoms ruled by indigenous princes under British supervision (with the exception of Ajmer/Merwar, which was under direct British rule), and Jaipur was one of the most prominent of these kingdoms. After India's independence in 1947, these rulers ceded sovereignty to the new Indian republic, and their kingdoms were consolidated into the Indian state of Rajasthan in 1949, with Jaipur as its capital. We shall have more to say about the Rajputs later in this book, but for now it can be noted that they are associated with a romantic historical narrative that highlights their valor in war and their aristocratic ways, and the imagery of Rajasthan as the home of kings and warriors has served the state well from the standpoint of tourism. But although tourism is an essential part of Jaipur's economic mix, the city is preeminently an important governmental, educational, financial, and industrial center. Among its mix of industries, Jaipur is especially famous for traditional handicrafts, a major part of its appeal as a tourist destination. These include handmade footwear, pottery, handloom fabrics, printed cloth, and above all-jewelry. Jewelry and gemstones, moreover, are not just handicraft products; they are also the foundation of a major industry in Jaipur, for which the city is justly famous. No visitor to Jaipur can fail to see that jewelry and the city's life are deeply intertwined: Purveyors of jewelry abound at every level, from the posh shops on MI Road, Jaipur's Fifth Avenue, to pavement hawkers. 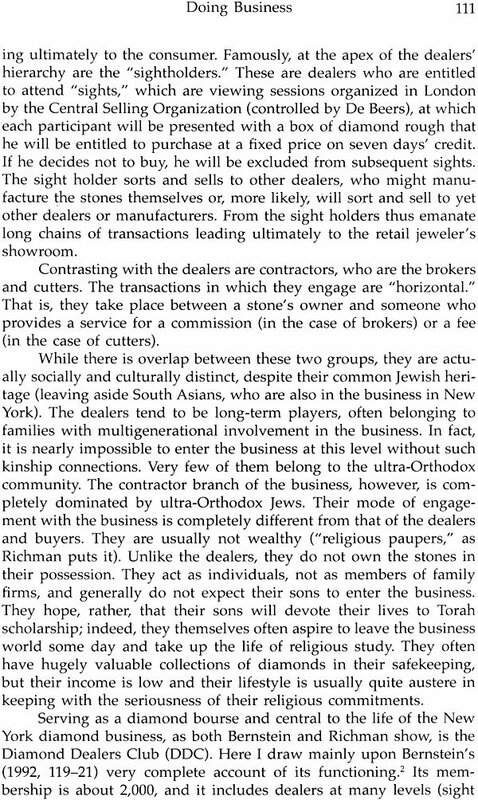 But what the visitor sees-mostly the retail jewelry business-is actually but a fragment of a much larger reality: a flourishing gemstone industry centered on the cutting and polishing of precious (diamonds, emeralds, rubies, and sapphires) and semiprecious (all others) gemstones. This industry employs tens of thousands of pre- dominantly Muslim artisans. Jaipur is not the only gemstone center in India. Mumbai and Surat are major diamond-cutting centers, and these days they have become more famous in this regard than Jaipur. Jaipur, by contrast, is known primarily for the cutting and polishing of colored stones. Its production is aimed at export markets for the most part, and nowadays Jaipur is undoubtedly the source of many of the stones that end up in shopping mall jewelry shops and TV shopping networks in the United States and other countries. 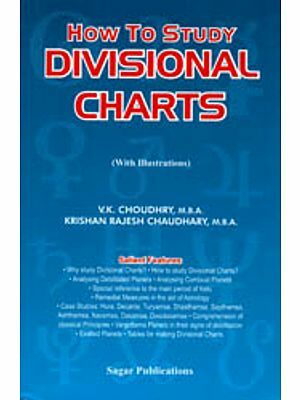 The Indian market has also expanded considerably in recent years owing to the dramatic growth of the Indian middle class. Jaipur manufactures a huge range of stones these days, precious and semiprecious. Historically, however, the industry was centered one stone in particular, the emerald, and emeralds will figure very prominently in the story this book has to tell. 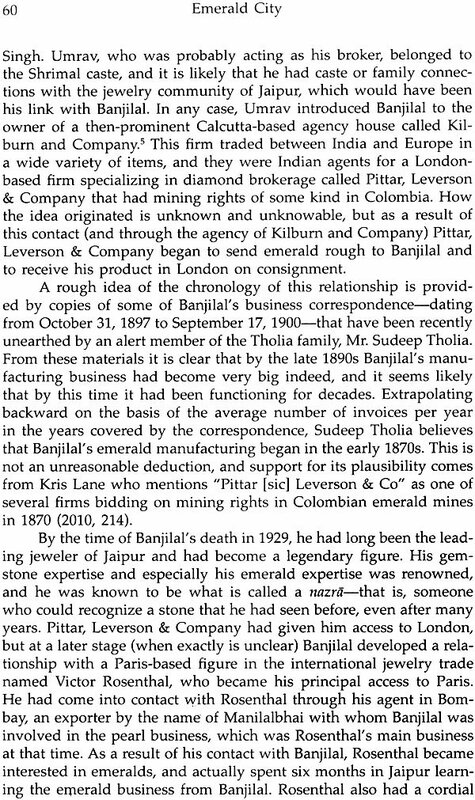 Although the gemstone cutting industry has partially moved out of the walled city in recent decades, and while many elite jewelers have moved out as well, the geographic, financial, and social heart of the jewelry and gemstone industry remains an area of the city called Johari Bazar, which means "Jewelers' Market." Johari Bazar is actually the name of a wide street with a central divider in Jaipur's walled city, but it also refers more loosely to the jewelry manufacturing and selling area to either side of this street. The street runs north and south between Bari Chaupar (also known as Manak Chauk) and Sanganeri Gate; the area extends (very roughly) two or three parallel side streets to the east and west. During the day and early evening the street itself is a veritable river of vehicles, and getting across it on foot can be a serious challenge. 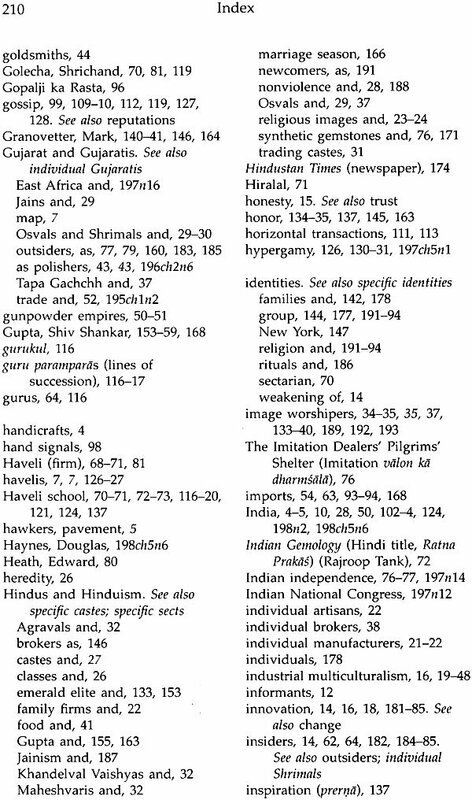 It is lined by shop fronts with identifying signs mostly written in Hindi script rather than Roman characters. These businesses are varied, but many are retail jewelry shops that sell their wares both to local customers and to the hordes of tourists who frequent this area because of its reputation as a place to buy jewelry. The most visible manifestation of the actual gemstone cutting business on this main street is a large, daily gathering of men spilling out into the street in the vicinity of Standard Pharmacy. This is one of three street markets, generally seen as the bottom of the business, where brokers and artisans buy and sell gemstones and finished jewelry. Retail aside, the actual geographic heart of the gemstone and jewelry industry is to be found in the maze of side streets and back lanes in the interior of the city beyond the main street. A first-time visitor to this interior area is likely to be astonished at the apparent chaos of activity, but it is not chaos to those who work and live there. Even the widest of these streets seems narrow, for they were designed in an era in which the city was much less crowded and in which vehicular traffic was far lighter than today. Nowadays, foot traffic is extremely dense during the business day, especially along the wider of these streets, and pedestrians must constantly duck and dodge noisy scooters and motorcycles as they weave through the crowds. From time to time a larger vehicle tries to make its way through the area, adding to the turmoil by creating a slow-moving bottleneck. The busier streets are lined with shops-many jewelry shops among them-and pavement vendors of vegetables and fruits somehow man- age to conduct their business in the midst of all the coming and going. Their presence reminds us that this section of the city is a residential as well as a business zone, and therefore every kind of commodity necessary for urban life is on sale here. This is where we find the gemstone-cutting factories. As one moves along these streets and lanes, one can see dimly lit, often very cramped shop fronts that have been converted to small factories for gemstones or jewelry, sometimes with just two or three artisans. But most of the manufacturing activity takes place invisibly behind featureless walls in a warren of courtyards, balconies, corridors, and rooms in residential properties or other buildings. The old pattern was for manufacturing and trading to be done at the residence of the business's owner or owners. The classical urban house (known as haveli [haveli]) lent itself well to this kind of activity. These structures were built around an open courtyard, which provided natural lighting, once essential for gemstone manufacturing. Nowadays these properties are still being used as offices and factories, but they are frequently unoccupied by the families that built and own them. From the outside, most of these structures are quite unprepossessing and an uninformed visitor would be surprised to learn of the vast quantity of wealth that passes through (and is created within) such modest premises. We'll have a closer look at what actually happens in these factories in a later chapter.